Published Oct 24, 2017 by Addison-Wesley Professional. Part of the LiveLessons series. 3 hours of video to get you started using Ansible, focusing on key skills with multimedia tutorials that can be applied to real-world scenarios. 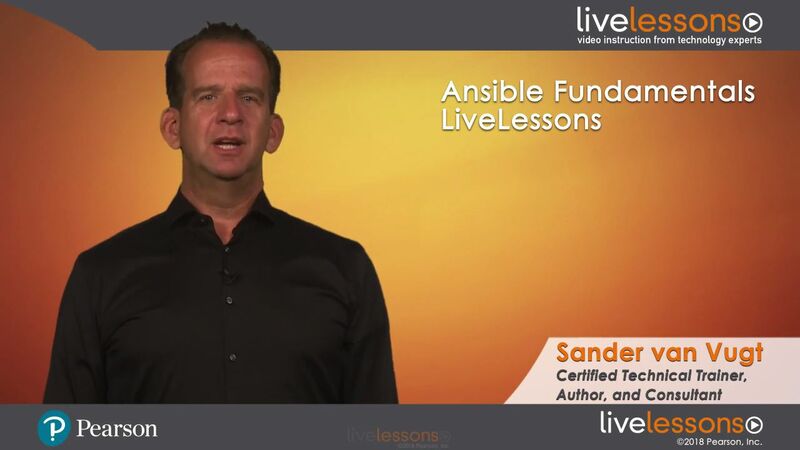 Ansible Fundamentals LiveLessons provides a quick introduction to Ansible for administrators and developers who want to get started in a fast and easy way without spending too much time on details. Since it was first released, Ansible has become one of the most used systems for configuration management. This course covers key fundamental topics, so you can get up and running quickly. The course starts with an introduction to working with Ansible, including essential configuration to get you started as quickly as possible. You then learn about Ansible architecture and essential Ansible components, including playbooks, variables, task control, flow control, conditionals, and Jinja2 templates. Every lesson ends with a lab and lab solution, so you can see firsthand how to use Ansible in your own work. Lesson 1 demonstrates how to get started with Ansible. Get up and running as fast as possible. Run some tasks using Ansible to understand what it is doing and how it is doing it. Lesson 2 covers Ansible architecture and the different components that are typically involved in an Ansible environment. Understand how to run a successful Ansible deployment, and learn about modules, which are probably the most important parts of Ansible; they enable you to do anything in an Ansible environment. Lesson 3 covers Ansible playbooks. A playbook contains the instructions that are needed to run tasks in an Ansible environment, and they are written in the YAML format. Get started with YAML and create and run playbooks. Lesson 4 demonstrates how to work with variables, facts, and inclusions. All of these make Ansible more flexible. By using these different components, you can apply parameters in a flexible way even if the configuration might change. Lesson 5 discusses more items that make Ansible such a flexible solution. Work with flow control in an Ansible environment, look at using conditionals, and create some templates. These items make it possible to easily apply host-specific parameters in configuration files and in a flexible way.